Download the final report and the charrette workbook to learn more about this study. Ashland, like many other small communities lying within the Interstate 80 Corridor, faces myriad challenges as it seeks to preserve the best of small town life and culture while opening up to opportunities offered by rapid urban growth. By 2050 it is estimated that as many as 250,000 commuters will travel from towns like Ashland to jobs in Douglas and Sarpy Counties alone. Scenario A preserves and builds on the existing neighborhood core northwest of downtown and suggests a transit/train station along Highway 6 to encourage and define commercial development and celebrate the town’s transportation/railroad roots. New commercial development is controlled along Highways 6 and 63 to conform to the existing community aesthetic and scale. Commercial and industrial development at Ashland-Greenwood exit is controlled to create an attractive, highly visible entry portal to the town. Agricultural and natural terrain interacts with and flows into the community, and new residential development to the east conforms to existing topography and historical sites. Scenario B focuses on aesthetic design treatments of neighborhoods and highway corridors, suggesting specific codes to require houses to conform to a “front porch” aesthetic with street trees and narrower setbacks from the street to create a more human-scaled, pedestrian environment. Highway corridors make generous use of greenbelt buffers—street trees and other plantings—and include old-fashioned street lights and other landscaping elements to conform to an historic, small-town aesthetic and to enhance the pedestrian environment. Scenario C targets specific zoning areas and suggests that new single-family residential be contiguous with existing SF residential areas and locates higher density residential/commercial neighborhood centers within these residential areas. These neighborhood centers would include townhouses and apartments, low-rise business uses, structured parks and schools. They would not compete with the downtown, which would remain the primary retail center (and high density residential), but rather they would serve the immediate neighborhood populations and encourage more walking and bike trips for daily needs. Floodplains to the south and north of the town would be designated unstructured, natural areas or parks. Industrial uses would be concentrated in a compact zone near Highway 6 and the rail line, as would a park-and-ride transit hub near a proposed train station or bus stop. A new direct road to the interstate was also suggested at the west end of the downtown area. Overall, the schemes emphasized a small-town feel through planning and design standards that encourage traditional neighborhood scale and open, “front-porch” streetscapes. 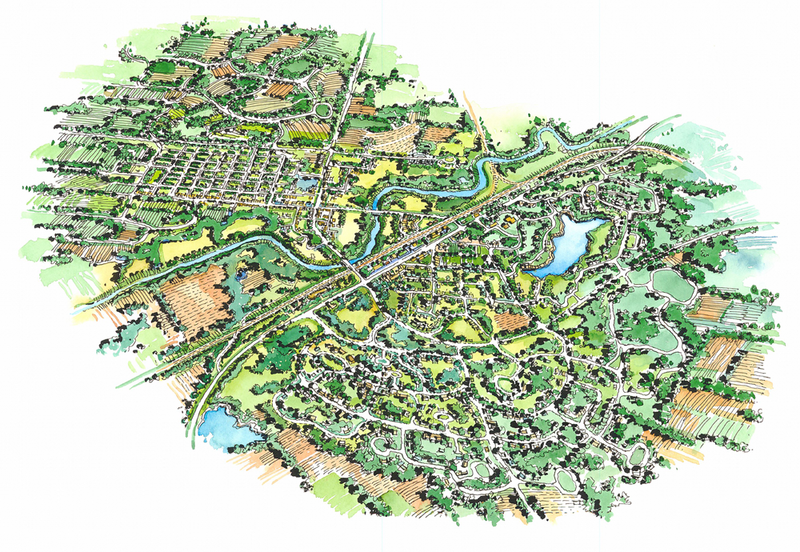 New codes may be needed to encourage new development to connect to and build upon existing, compact neighborhood design and to preserve, expand and enhance the existing neighborhood core. Historic, small town appeal that can be preserved, enhanced and expanded through zoning and planning. Location near major cities, I-80 and along a major highway and proximity to recreational attractions suggests an ideal location for a commuter rail stop. Many of the town’s residents commute to Lincoln or Omaha, and as such Ashland has one of the longest average commute times of any town or city in Nebraska. Potential as an alternative agricultural economic center. The town is near some of the best agricultural land in the state. The town needs a strong identifier to draw people to the community. Existing blight along the Highway 6 entrance and lack of a strong entry portal further compound identity problems. There is also a perception that the community lacks diversity and that sharp divisions exist between long-time residents and newcomers. Many of these newcomers daily commute to Lincoln or Omaha, further exacerbating the perceived divide. Floodplain that limits growth, infrastructure/technological incapacity to address challenges and opportunities of rapid growth. Housing challenges including uncontrolled sprawl development (trend toward a decentralized core/low-density westward growth) and lack of affordable housing. Loss of small town atmosphere and character due to the effects of nearby urban growth, including leakage of local retail to larger urban markets. Lack of communication and coordination between town and county jurisdictions. Proposal for a huge lake development that would inundate most of existing Ashland. This controversial proposal, introduced in the 2005 Legislature, was strongly opposed by town residents and failed to garner enough votes for even a study. However, the idea persists among certain political and development interests. The workbook used by charrette participants is available for download here.